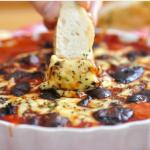 Keto Pizza Dip is the perfect game day appetizer. This dip is super easy to make and can be served with keto bread. It's a low carb and keto diet friendly recipe. Pre-heat oven to 350F. Measure out the cream cheese and microwave for 20 seconds until room temperature. Mix the sour cream, mayonnaise, and mozzarella cheese into the cream cheese. Season with salt and pepper to taste. Divide the mixture between 4 ramekins, then spoon 2 tbsp. Tomato Sauce over each ramekin. Measure out 1/2 cup mozzarella cheese and 1/4 cup parmesan cheese. Sprinkle mixture over the top of the sauce evenly and add toppings of choice to your personal pan pizza dips. Bake for 18-20 minutes or until cheese is bubbling. Remove from oven and let cool for a moment and serve with Keto Breadsticks.